The BRISKEN Market Data Hub is an end-to-end market data governance solution, which provides a central repository for market data that ensures that every system across your company is using exactly the same high-quality data. Bring in data from a growing catalog of data sources ready to be consumed without any kind of development or technical skills, and benefit from ready to be consumed data from providers such as Bloomberg Data License, Thomson Reuters DataScope Select, OANDA Exchange Rates, Central Banks and other data feeds. 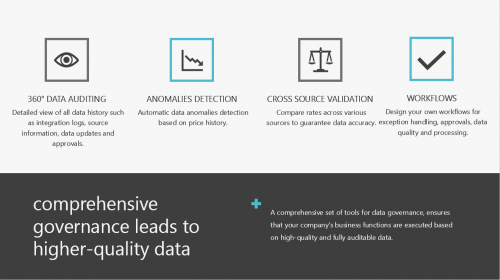 Perform data validation such as anomaly detection and consistency checks on your data before distributing it across your landscape. 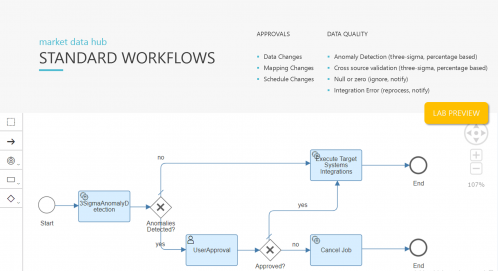 End-to-end data governance with exception workflows and audit reports. 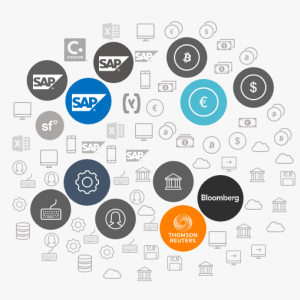 Individually schedule your automated integration of the market data to SAP and non-SAP systems, including SAP ECC, SAP S/4HANA, SAP Analytics Cloud, Concur, Business by Design, Hybris. Part of the brisken market data hub is its growing library of market data databases, sources, and providers. Additional providers are added with each release, based on customer demand and relevance. The brisken market data hub acts as the SINGLE SOURCE OF TRUTH for all things market data in your system landscape. With its FLEXIBLE DATA CATEGORIES you can set up any instrument or indicator you chose. With easily CONFIGURABLE MAPPING and TRANSFORMATION RULES you get data from any supported source into any supported target system. Whilst we are adding constantly additional instruments to our delivery setup of the brisken market data hub, you can configure your own additional instruments according to the user requirements. Flexible definition of any new data set (instrument or price type) by simply configuring a new dataset category in the market data hub. Granularity: schedules are assigned to tasks. From a single instrument to of thousands of instruments can be grouped together in a task. Using scheduling, transformation, and mapping you define you own schedules for the data retrieval from the source and the distribution to the target systems. The brisken market data hub comes with a preconfigured set of mappings and transformations which you can extend yourself. Rules such as changing the validity date for upload into SAP, or calculating the 30 day average rate are provided out of the box. The brisken market data hub provides a workflow based end-to-end control of the entire process for the management of market data, with status and quality monitoring and complete audit trail, automated data validation, consistency checks and and anomalies detection. The apps issue desktop alerts, messaging, or kick-off related exception workflows. The brisken market data hub provides end-to end data governance features, that can be configured to your own needs. The brisken market data hub provides two types of workflow events, approvals and exception handling. 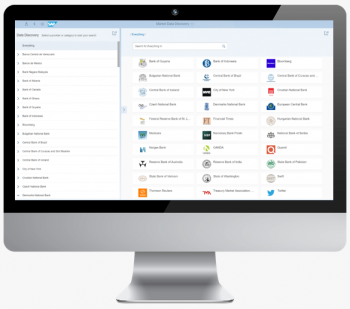 Based on the Market Data Hub Workflow Services in combination with the SAP Cloud Platform Workflow Services you can design and create your own workflows. Brisken provides a number of workflow templates which you can simply activate and use out of the box. 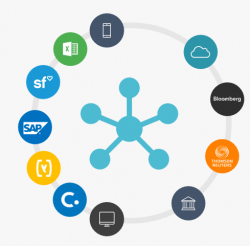 The brisken market data hub provides plug&play integration with the most common SAP systems and platforms. The market data hub delivers the data to any app or system that can consume the market data through RFC or ODATA enabled dataset. The automatic integration schedule is controlled by workflow and constantly monitored through detailed audit reports. OData APIs for data acquisition by external apps like Microsoft Excel.